We get calls every week asking us if we offer recycling programs for neighborhoods—if we’ll come pick up an old washer dryer set for scrap recycling or come by to get a big stack of newspapers and cardboard boxes. While we focus on large-scale, industrial recycling, and don’t have any residential recycling programs, we do form close public-private partnerships with many municipalities and government agencies in the southeast to make recycling easier and more efficient for the average household. WIth nearly 250 million tons of municipal solid waste generated every year in the United States, it’s important to us to help promote a green culture at work, school, and home. Here are a few steps that your household can take to make the world a better place. 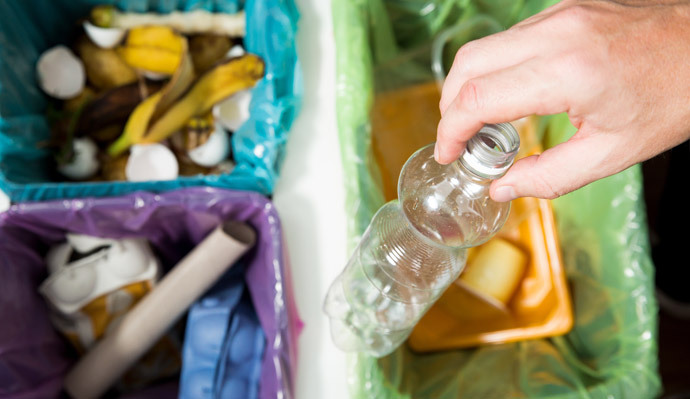 With all of the emphasis placed on recycling, it can be easy to forget that recycling is actually at the bottom of the sustainability hierarchy. This is true for businesses as well as for individuals. For example, the McDonald’s corporation was able to save 68,000,000 pounds of cardboard each year simply by pumping their soft drink syrup directly from the delivery truck into the tanks in their restaurant rather than having the syrup shipped in boxes. While you can’t keep 68 million pounds a year out of landfills, the point is that avoiding packaging altogether is better than cardboard recycling. Look for loose fruits and vegetables rather than packaged versions, bring your own bags to the grocery store, choose reusable growlers or boxed wine instead of bottles that are more difficult to recycle, and buy products that use post-consumer recycled cardboard as much as possible. While these might feel like tiny drops in an enormous bucket, every eco-conscious decision adds up. It’s no secret that Americans throw away too much food. In addition to paper and cardboard waste, food waste makes up the majority of our landfills by weight—both of these categories equals about 30-percent of landfill contents. In fact, food waste has become such a problem that the United States’ federal government has set a new goal to reduce food waste in the U.S. by 50 percent over the next 15 years. The absolute best way to reduce your household’s organic waste is to make less food and order less when you go out. Think about your family’s eating habits. Many meal planners overestimate how much each person will eat, whether at home or at a restaurant—especially when it comes to young children. A good general guideline is to prepare ⅓-½ a pound of meat for each adult that you plan to serve. So cut recipes in half for your family or order plates to share at restaurants. Those portions are huge! Not only will this benefit the environment, it will also boost your budget. Other than making and ordering less, the most effective way reduce organic waste at the household level is to compost your food scraps. Composting is simple, adds valuable nutrients back into the soil, and keeps food scraps out of plastic bags, where they take longer to break down. Also, since a good compost pile should contain about 70% brown waste (dry leaves, grass clippings, branches, cardboard, paper products, etc) this is a great way to reduce your yard waste and your packaging waste as well. Do I have recycling pick-up? Maybe your municipal waste management team dropped off a blue bin at your house, and all you have to do is fill it up and set it by the curb. Great! If not, call your county offices to see if curbside pick-up is available in your neighborhood. In some municipalities, you have to request pick-up. Where are the recycling centers in my area? If you don’t have curbside pick-up, or if you have larger or hard-to-recycle items, look for free drop-off sites near you. Search your county website for a listing—most have more than one center where you can drop recyclables. We know it takes a little extra effort, so start slow, maybe just recycling cardboard at first, and make it part of your routine. Again, every municipality is different. Some offer single-stream recycling, some require sorting. Some accept nearly anything, some won’t take glass or some plastics. Search your county website for a complete list and then use this information in your purchasing decisions as much as possible. What can I do with hard-to-recycle items? Car batteries, eyeglasses, electronics, plastic grocery bags, smoke detectors, printer cartridges and other large items often can’t be recycled by your municipal recycling program. Fortunately, there are other avenues to dispose of these kinds of items responsibly. Many auto stores will accept car batteries—and even give you a credit for the exchange. The same is true of many office supply stores that accept used ink cartridges for refill, while some grocery stores have large bins at the front of the store for recycling used plastic grocery bags. At Recover, we’re proud to partner with municipalities to make recycling a routine part of your household culture. Our efforts help your county and city governments put money back in their budgets so they can provide better services and improve roads and schools for their residents.